San Francisco is known for many things. Picture the city in your mind and you’ll likely conjure up some combination of the roiling topography, bohemian culture, vibrant nightlife, and beautiful views that make it unique among American cities and a top destination for tourists from across the world. If you know your history, you’re probably also familiar with the city’s historic role as the focal point of the 19th century “Gold Rush” that propelled California to statehood. As it turns out, gold wasn’t the only thing that San Franciscans discovered during that frenetic period. They also managed to gift the world with their iconic sourdough bread, a San Francisco culinary staple to this day. It’s a novelty in most American cities, but sourdough bread is actually fairly common elsewhere in the world. Besides the high proportion of rye in their doughs, the main difference between “regular” breads and sourdoughs is the presence of lactobacillus bacteria in the leavening. These one-celled organisms, which coexist peacefully with the leavening’s yeast, produce the tangy lactic acid that gives sourdough its customary flavor. From the very first bite, you’ll notice that San Francisco sourdough is even tangier than other varieties of the bread. That’s because many of the “forty-niners” who arrived in the city during the Gold Rush and set up bakeries in town developed their own hardy dough with a proprietary strain of lactobacillus. Many of the original mid-19th century sourdough “starter cultures,” which bakers keep alive with regular feedings of flour and water when they’re not using them to start new batches of bread, remain alive today. No other American city has such a robust bread making tradition. If you prefer, San Francisco’s extra-tangy sourdoughs are bold enough to be enjoyed bite-by-bite on their own, but most agree that the bread is made to be paired with other foods. Fortunately, the forty-niners seem to have accounted for this. Many hometown San Francisco classics, like thick chili, clam chowder, and delicious cioppino soup, all go well with sourdough bread. Making zen-like sourdough-soup matches is the bread and butter, or at least the bread, of plenty of successful San Francisco cafes. Next time you’re in town, be sure to stop in at one of these fine San Francisco sourdough institutions. 1. Boudin Sourdough Bakery and Cafe. “Sourdough” is right there in the name, so you know it must be good. 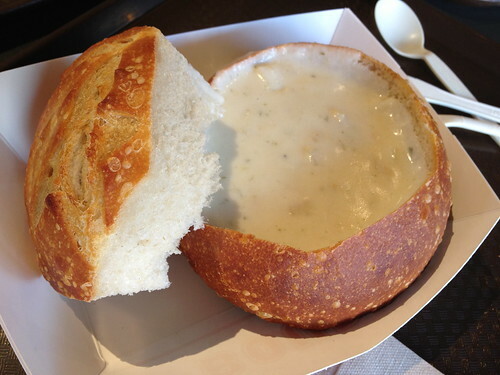 Boudin makes their own clam chowder, among other seafood delights, as well as traditional fare like ribeye sandwiches. There are several locations around the city, including one on Fisherman’s Wharf. 2. Acme Bread Company. With its prime location on the Embarcadero near the Financial District BART station, Acme is a high-visibility institution. The sandwich menu is long and their lunch crowd is fierce, so be prepared to wait in line. 3. Royal Bakery. A neighborhood favorite tucked away in the Excelsior District, this is where real San Franciscans go for real sourdough bread. It’s cash only, but you won’t mind once you take that first bite. With hundreds of other bakeries that specialize in fresh San Francisco sourdough bread, even local die-hards can’t possibly have tried them all. If you have a free day in the city, take a bite of history and plan a walking tour of some San Francisco sourdough institutions.